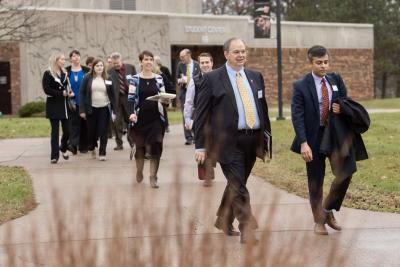 Four years ago, James Schmidt became chancellor and face of the University of Wisconsin- Eau Claire. Since then, he has become widely known as Chancellor Jim on the campus and in the community. He is very passionate about Eau Claire, its people, and its atmosphere. "Tell us who you are and what you like to do!" Jim: Sometimes I get accused of working for the University of Wisconsin- Eau Claire because I&apos;m a relentless cheerleader, or advocate, for the community. My wife and I moved here four years ago and have fallen absolutely head over heels with the city. Whenever I have friends or family visit, I get them in the car and take them to hidden gems. I find straight lines to be boring, and so I like to be able to be surprised when I turn the corner here in Eau Claire. "How do you react to being called a local celebrity?" Jim: I&apos;m blushing, I guess, I don&apos;t know how to say that. I think if I&apos;ve been called that, it&apos;s because I&apos;m often told I&apos;m everywhere and that&apos;s because I&apos;m still relatively new to the town and there are so many great things. I don&apos;t know how you can possibly sit home. "What&apos;s one unique experience you&apos;ve had in Eau Claire?" Jim: When I was first considering moving and applying for the job in Eau Claire, I made what I call a "secret shopper" run here in Eau Claire because I hadn&apos;t spent much time here. I drove around the community, met with some business people here, visited friends, and came onto our campus. I was dressed in a suit, and I walked into the Davie&apos;s student center and I went up to a table full of students. I asked if I could join them and they said, "of course" and I asked them "Why did they choose Eau Claire" and asked, "What do you love most about the place?". And I sat back and I listened to the most amazing things. I heard students talk about all there is to do in the community and how beautiful the campus is. One student said, "I thank God every day for my decision to come here to this institution. I have found my voice. I have found my passion and my purpose." I think that other visitors can do that. They can discover things about themselves by coming to this community. It was those things that made me come and apply to be here in 2013. "What is your favorite winter activity?" Jim: Well, you know, I think that crossing the UWEC footbridge when it&apos;s 20 below is one of the most memorable things anyone can do. One of the things I love about the spirit of our Blugolds is we embrace our adversity, so students branded the notion of "#bridgeface" and understand that it&apos;s all worth it, to be in this area. And we also embrace the infamous hill on campus, to ensure that we do not have the "Freshman 15" on our campus. For winter, I love the natural beauty. My kids and I often find sledding hills in the area when it&apos;s not quite 30 below. "What is your favorite summer activity?" Jim: My wife and I love the music festivals. We schedule our whole calendars around making sure particularly that we can go to the Eaux Claire Music Festival. Summer and music in Eau Claire is phenomenal. So we love the Thursday night concerts over at Phoenix Park, the Tuesday and Wednesday concerts at the band shell at Owen Park. We also love the farmer&apos;s markets. I love that there is a farmer&apos;s market six out of seven days. Of course, there&apos;s the big one down at Phoenix Park, but I like going to the one down at Festival (Foods)&apos;s as well. The idea that we have access to so many locally produced foods, fruits, vegetables, meats, is really incredible. We love that. I also have boys who participate in athletics at the local baseball fields. And nothing relaxes me more than getting out on the water in the boat at Lake Wissota or one of the other lakes. "Where is your favorite place to grab a cup of coffee?" Jim: Eau Claire has so many great coffee shops! Part of the fun is not being able to choose, and they&apos;re all different and interesting. Close to the campus here we have the Goat, Racy&apos;s and the Nucleus, and then you go downtown and there&apos;s the Acoustic and a new one off Madison Street, Caffe Tempo. There are so many good ones. And I&apos;m a huge coffee nut; I love good coffee. "Where is your favorite restaurant?" Jim: So, Eau Claire has so many great options for restaurants. I like some of the ones that have been here, and I really like some of the newer ones. You&apos;ve got the Lakely, Informalist for some of the new ones, of course, we love Mona Lisa&apos;s as a favorite place, and you know, there are some great hole-in-the-wall places that people told me about when we first moved here, I love going to Egg Roll Plus. Particularly when it&apos;s 20 below and it&apos;s really cold, there&apos;s nothing better than having a great big bowl of pho and putting it in front of you and just having that steam roll over your face. Johnny&apos;s Steakhouse and the Livery have great atmosphere and food, too. "Could you see yourself living anywhere else in the world?" Jim: Not right now. Not right now. This community is so much on the move and this university has been a great partner in those efforts. Over the next five years, parts of the city are going to be transformed near the river. It creates greater options for visitors. I think that these kinds of activities are going to attract talent. This will be a great place to work, live, and play. I believe many companies will move to Eau Claire because this is the place that will attract talent to the region. That&apos;s exciting. How could I imagine trying to do something anywhere else that&apos;s close to this? "What&apos;s something you&apos;d like a visitor in Eau Claire to know?" Jim: I&apos;d encourage any visitor to come to the campus as a destination. Our spaces are open to the public. You will find a great array of entertainment. We have a beautiful area along the river. Putnam Park is something everyone should experience. How many cities of this size can you take a few steps and yet feel like you&apos;re 30 miles in the wilderness? We also have many collections that people are not aware of. We recently got a collection of Native American pottery that&apos;s open to the public. Most people wouldn&apos;t know that we have one of the Midwest&apos;s largest collection of original Robert Frost writings, letters, and correspondence. We have one of the largest collections of Jazz music in the world, both sheet music and recordings. We have people from all over the world come to look at those collections. Chancellor Jim is active and popular on Twitter and invites citizens, students, and visitors to follow him @ChancellorJim and #askaway about anything Eau Claire- related.